Soccer is a fall sport at Isaac Newton. We have a 5/6th (JV) co-ed team and a 7/8th grade co-ed team. This year 2018 Head Coach for 7/8th grade team was Tim Stout, Asst. by Alumni student Jeralyn Wessel. 5/6th grade Head Coach was Cal Vaughn assisted by Keith Bowe. We offer volleyball for 5th/6th and 7th/8th girls. The volleyball season runs Sept and Oct. Coaches focus on the fundamentals of bumping, setting, and serving. Students are shown how to spike, but that skill may not be totally developed. All players will master serving underhand before serving overhand. All players will have some playing time in each match, but not necessarily in each game. Our desire is to give each girl a chance to serve at least once each match plus play at least half of one game. 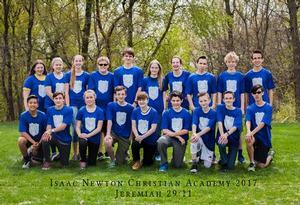 Isaac Newton offers boys’ and girls’ basketball at the 5th/6th and 7th/8th grade levels. Basketball practices begin in November, with games December – February. Brothers Alex and Brett Harris penned the book "Do Hard Things" when they were 18 years old. The best seller's theme is "A Teenage Rebellion Against Low Expectations" and serves as a catalyst for a challenging 8th grade Physical Education Unit. The 8th graders start the school year with an eight week Cardio Kickboxing Unit that challenges them physically and mentally. The students encourage each other as they strive to push through each workout. Then in the Spring, the final assignment is completing a ROPES challenge course together.